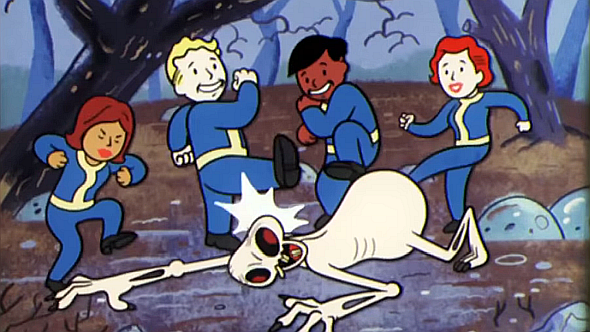 Fallout 76 might be out very soon, but Bethesda doesn’t want it to be a flash in the pan. Instead, the developer intends it to last us until the bombs drop, and beyond. In a recent interview, the company’s vice president of marketing, Pete Hines, says Bethesda plans to keep the latest trip to the Wasteland going for a long time. When asked how long he thinks Fallout 76 can last, Hines was very quick to answer – “forever. I’m not being ironic. Like, forever.” That’s quite the suggestion, but Hines had evidence to back up his seemingly hyperbolic claims, which stems from the popularity of some of the studio’s other recent (and not so recent) open world games. “Those games have been out for four and seven years, and there are literally hundreds of thousands of people playing those games every single day, every single month.” It’s difficult for us to verify those claims exactly, but Steam Charts reckons Fallout 4 peaked at 47,573 players this year, with similar numbers for Skyrim, if you combine the numbers on its two most-popular editions. That’s just for PC, of course, so assuming the same kind of figures on console, and Hines is probably right. The Fallout 76 release date is pretty close – November 14. Clearly, we won’t be getting a look at the game’s long tail for a while, but with an enormous map and a literally explosive endgame, there should be plenty for you to get stuck into, with or without an eternity of ongoing content.